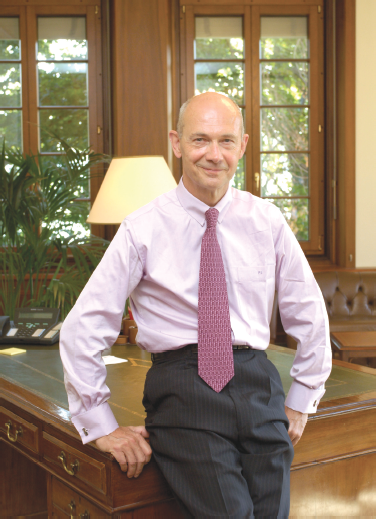 Pascal Lamy, Director-General of the World Trade Organisation, addresses an audience at Bilkent Univeristy Ankara upon receiving a Doctorat Honoris Causa, 15 March 2013. Being with you in "bilim kenti," the city of learning and science, I am both honoured and moved. "Honoured" because there is nothing more humbling than to stand here before you today, in this house of knowledge, to speak about the place of the World Trade Organization in the global governance architecture. It is the researchers, scientists, and academics like you that allow the world to engage in a deeper reflection of where the world is headed. It is the bastions of science, such as the University of Bilkent, that allow us to look at our planet from a distance - stopping the clock on our day-to-day chores - to assess where we really are and where we ought to be going. "Moved" because I still remember the very founder of this institution, Ihsan Dogramaci, who had contributed to the establishment of numerous public institutions of higher learning, who had served as rector of Ankara University, and as founder and first rector of Hacettepe University. A towering figure in the world of knowledge and education, and a dear friend of my late father-in-law. I pay tribute to his family members in the audience. Ladies and gentlemen, to speak about global governance, is no easy task, in particular in a world as troubled economically and as challenged politically as the one that we live in today. Since 2008 we have been in the midst of the deepest economic crisis that the world has known since the Great Depression. We have witnessed political turbulence - such as the neighbouring Arab Spring - of proportions few had thought imaginable. Social pain and widespread unemployment have been the consequence. Meanwhile, climate change has continued to progress unabated, with Tsunamis and other natural disasters that we thought were confined to the science-fiction universe, taking place right under our very own eyes. In the face of all this, it would be easy to shrug one's shoulders in despair. It would be easy to feel helpless and overwhelmed. And, yet, what history teaches us is that our greatest strength is born of our moments of greatest weakness. The General Agreement on Tariffs and Trade - a watershed agreement in global economic and trade co-operation - was itself born out of the ashes of the Second World War. In fact, the catastrophy of the Second World War brought in its wake an unprecedented joining of hands at the global level between visionary statesmen and women and politicians who wanted to make the world a better place. A large number of international institutions were created immediately after the war by a humanity traumatized by war and destruction; wanting to build a future based on higher ethical standards, deeper scientific knowledge, and a vastly improved global governance architecture. And, by and large, I would say they made it. But there is more to be done because history doesn't end here. This is just the beginning of another chapter in our collective story. As we continue to write our history, the world has seen an unprecedented level of globalization. But our capacity to harness that globalization through proper governance has certainly lagged behind. Such a "governance deficit," I would argue, puts the world at risk. Ladies and gentlemen, I have often likened governance systems to the three states of mass. The national level, in my view, represents the solid state. The international level, the gaseous state. And in-between would lie the efforts for greater regional economic and political integration, like the European Union which Turkey is attempting to join, which I would say are in a liquid state. What I mean by this is that our governance chain, today, weakens the further it rises because citizens are left farther behind. Our end goal should be to make our governance structures more solid both horizontally and vertically. For this to happen, we must strengthen the links between the highest and the lowest levels of governance. In this global village, citizens have be involved not only in local governance but in regional and global governance too. Whichever the state of the mass, what is required to have a governance system work is a combination of political will, capacity to decide collectively, and accountability. Let me now walk you through the four principles of global governance, as I see them. The first point that I would stress in the creation of effective governance systems is the importance of the rule of law and that of enforceable commitments. Global governance must be anchored in rules, in international commitments, that foster and promote their respect. This is at the heart of the multilateral trading system, with its more than 60 year experience of regulating trade relations amongst nations, and with its binding dispute settlement system that ensures compliance. This is also at the heart of what the international community is striving to achieve on climate change; a multilateral deal in which nations commit to carbon emissions reductions, with accompanying measures to strengthen capacity for adaptation. It is also at the heart of what the international community is seeking to accomplish in the area of nuclear non-proliferation. Commitments which are anchored in a multilateral context; which can be monitored and subjected to effective dispute resolution systems, and which go hand-in-hand with proper capacity building. The second principle that I would stress is that global governance needs to respect the principle of subsidiarity. It is about taking decisions at the level at which it would be most effective to do so. The international system should not be overburdened with issues which are better dealt with at the local, regional or national level. The third principle that I would stress is that “coherence starts at home”. Coherence lies, first and foremost, with the members of international organizations. Take the United Nations. We can and must have the “United Nations Deliver as One”, but for that to happen United Nations members must also "Behave as One” in the different organizations to which they belong in the United Nations family. The final principle that I would put to you is that since the political “demos” remains essentially national, legitimacy would be greatly enhanced if international issues were to become a larger part of the domestic political debate. The exercise of democracy today needs an international dimension. The fact that citizens elect the governments that represent them in global institutions is not itself sufficient to ensure the legitimacy of international organizations. The fact that in an organization such as the World Trade Organization, decisions are taken by consensus, and are based on one-country one-vote, may not be enough to ensure its legitimacy in the eyes of our global citizenry. More is required. National actors — political parties, parliaments, civil society, trade unions, and citizens — need to ensure that the issues discussed and decided at the “global level” are carefully explored, first, at the "domestic level." The bad news is that global governance remains far from this ideal structure. The good news is that much of what I have described is already in motion; it is being done gradually, and not through a big bang. The global economic crisis that we are witnessing has accelerated the move towards a new architecture of global governance, in what I have called a "triangle of coherence." On one side of the triangle lies the G-20 - of which Turkey forms part as a major emerging economy, replacing the former G-8, that is meant to provide political leadership and policy direction. On another side lie the member-driven international organizations that provide expert knowledge, be they in the form of rules, policies or programs. The third side of the triangle is the G-192, the United Nations, which provides accountability. In the longer term, it is my hope that both the G-20 and international organizations will report to an eventual “parliament” of the United Nations. In this respect, a revamping of the United Nations Economic and Social Council could lend support to the recent resolution on United Nations system-wide coherence. With time, the G20 could even be a response to the necessary reform of the United Nations Security Council. A structure of this type needs to be underpinned by a set of core principles and values. And this is precisely what German Chancellor Angela Merkel has proposed with the creation of a Charter for Sustainable Economic Activity. It is a commendable effort to provide a “new global economic contract," to anchor economic globalization in a bedrock of ethical principles and values. This would renew the trust of citizens in their policy makers, which is vital to make globalization work. But let us recognize that this "new software" of values still needs to be constructed and needs to be moved away from an exclusively Western set of values. The African, the Asian and other value systems will need to be brought to bear. Some countries, such as Turkey, seem to me to be well placed to contribute to this new software, the purpose of which is to overcome deeply entrenched cultural divides, and to create a common vision based on human dignity. Let me now turn to the World Trade Organization, and how it scores on the global governance scoreboard. Where does the World Trade Organization feature in the governance landscape? The main mission of the WTO is to regulate trade opening for the benefit of all people. To perform our task, we use four main channels. First, we offer a forum where our members negotiate international agreements which are then adopted. Second, we have monitoring and surveillance mechanisms — including peer reviews — of member states' actions. Third, we have a strong mechanism of adjudication and enforcement of our members' obligations. Finally, we have a mandate to ensure coherence with other international organizations, specifically in the field of capacity building for developing countries. The basic value underpinning the WTO is that market opening enhances global welfare. The multilateral trading system helps to increase economic efficiency — and it can also help reduce corruption and bad government. At the same time, the WTO also recognizes the importance of values other than trade efficiency via competition. While far from being a perfect model, the WTO is nevertheless a laboratory for harnessing globalization and contributing to the construction of a system of global governance. In its Preamble, the WTO agreement recognizes sustainable development as one of its objectives. This calls for the consideration of fundamental values other than those of trade opening to include, for instance, the protection of the environment, development as well as social values. WTO members have the right to deviate from market-opening obligations to uphold certain values, such as protecting public morals, protecting the health of people or animals, or the conservation of natural resources. Moreover, pursuant to the WTO agreement, each member is free to determine the values to which it gives priority and the level of protection it deems adequate to achieve them. There are areas of the WTO where, in my opinion, the organization scores as much as others in the global governance landscape; in other words, areas where it gets an "equal to" sign. But there are other areas where it gets a "greater than" or "less than" sign. Let me walk you through these. The WTO is equal to other institutions of global governance in being a quasi-universal, member-driven, organization. It is equal to others in being an inter-governmental organization, albeit one that tries, like others, to reach out to non-governmental actors. It is an organization that is also equal to others in having a Secretariat and it's Director-General, with very limited executive powers, that must remain neutral, and only act as facilitators or honest brokers of the international trade relations between sovereign states. And it is roughly equal to others, quite frankly, in poorly defining the role of the Director-General. I must confess to you that my job description can be found nowhere in the WTO Agreement - nor that of my predecessors and nor will my successors find it! I have defined my own duties and responsibilities as I went on! Now, in saying that the organization is "equal to others" in these respects, this is by no means a criticism. When it comes to the actors, the WTO is a classic international organization where governments are members. Many argue that the WTO has problems of accountability. I believe that accountability with our members is high. The old club of the GATT has now given way to new groupings of states and coalitions. A new "G-7" (consisting of China, Brazil, India, the EU, Japan, Australia, the United States) has replaced the old QUAD (Canada, EU, Japan and the United States) on trade matters. The proposals of the G-20 (another one!) — a WTO alliance of developing countries on agriculture — are now the benchmark in many areas of the WTO negotiations. There are also important new actors, such as the group of Asean countries or the African group. Those who criticize small-format meetings — called "green room" meetings in our jargon — ignore the fact that, with around 160 members today, decisions to be taken by the entire membership need first to be prepared in smaller formats like committees in a parliament. The WTO, to some extent, also embraces non-state actors, as complex as the interplay with these legitimate stakeholders of the Multilateral Trading System may be. Indeed, we have no mandate from our members to enlarge the WTO family beyond governmental representation. Yet, we have made efforts within the current system. We now have annual Public Fora open to all participants, states and non-states, and regular WTO briefings are held for civil society and parliamentarians. Members of civil society can send in their views under the form of amicus curiae briefs to WTO adjudicating bodies (Panels and the Appellate Body) during dispute settlement procedures. Some hearings in ongoing proceedings have been open to the public. I believe that in its relations with non-governmental actors, the WTO scores equally to the international organization average. It gives them room to express their views, and welcomes all interaction, even if there is scope to go further. In numerous areas, in my opinion, the WTO scores better than others. First of all, the WTO has a stock of what I would call "hard rules;" disciplines and commitments. Its rulebook spans issues that range from agriculture, to industrial goods and services, all the way to trade in ideas and intellectual property rights. I often liken WTO disciplines to a "fishing net." Some of our nets are tight - even considered to be too tight by some - but some of our nets are wide, and do not catch the entire spectrum of uncompetitive business practices or trade distortions that are out there. Constant information sharing, discussion and negotiation by our members tighten that net. The WTO provides a permanent forum for negotiations among its members concerning their multilateral trade relations. Global governance requires intense discussions and negotiations — and, from that perspective, the institutional structure of the WTO is well-developed. We have various levels and forms of decision-making that can be multi-stage and sequential. All in all, it ensures that issues brought to the WTO cannot simply be swept away. I would say that the WTO stock of hard rules, its fishing net, make it the envy of many other organizations in fields such as the environment for instance, where others still dream of much greater discipline and control at the international level. Take the IMF for that matter, and its continued search for new disciplines on currency. But the WTO also performs better than other international organizations in its monitoring/surveillance and enforcement mechanisms. There are numerous WTO committees and councils where members' legislation is subject to peer review. The WTO Trade Policy Review Mechanism enables the regular collective evaluation and appreciation of WTO members’ trade policies and practices and their impact on the functioning of the multilateral trading system. In fact, at the Copenhagen Climate Summit a few years back, President Obama proposed that the WTO Trade Policy Review Mechanism be replicated in a climate governance context. Building global governance is a gradual process, involving changes to longstanding practices, entrenched interests, cultural habits and social norms and values. Through greater transparency and understanding of trade policies, the WTO review mechanism contributes to improved adherence by all members to the rules, disciplines and commitments of the organization. The ongoing negotiations taking place today in the WTO have reinforced this surveillance in the crucial areas of regional trade agreements. The WTO also hosts a monitoring forum on the Aid-for-Trade that is provided bilaterally, regionally and multilaterally to developing countries to assist them in trade capacity building. In the WTO, the non-observance of the rules may give rise to litigation — and the litigants are bound to accept the decision of panels or the Appellate Body. And there is no doubt, that this where the WTO vastly outperforms other international organizations. The strength of the WTO dispute settlement mechanism, its binding nature, and severe consequences it creates for non-compliance, not only make it the "crown jewel" of the organization as some have called it, but the crown jewel of the international system. When I speak to my friend and colleague, Achim Steiner, the head of the United Nations Environment Program, he tells me that a similar system in the environmental sphere remains, unfortunately, a distant dream. So where does the WTO score less than others? The WTO is a “consensus” based organization as many of you know. With its total of 159 members, the WTO decides when all members agree to decide - essentially! The idea behind this is to try to balance the interests of the big and the small, the rich and the poor. But this inclusiveness in decision making has a cost; it costs the organization both time and effort and often prevents finality from being reached to the many issues under discussion. We must also remember that WTO rules, and any changes that are made to those rules through rounds of trade negotiations, must be ratified by Parliaments. A process which also takes time to run its course. Consensus, there is no doubt, though, brings legitimacy and so does parliamentary scrutiny. Consensus-based rule-making in the WTO, when coupled with "bottom-up" approaches to decision-making, and limited Secretariat and Director-General powers, sometimes cripples the organization. In a number of other international organizations, the Secretariat plays a bigger role in leveraging its experience while remaining neutral. It has a "right of initiative;" in other words, the capacity to table proposals to facilitate negotiations and to broker compromises. In the WTO, that role is virtually non-existent, and when coupled with the need for consensus, can make it significantly more difficult to generate expert solutions to problems. In that sense, the WTO falls below the international benchmark. A study of the role and powers of the various Secretariats and heads of international organizations would actually be very revealing, and I would strongly encourage that a study of this nature be done at the international to trigger discussion and reform. I have myself looked at the issue, in particular at the "right of initiative" that I mentioned before, of Secretariats and their heads. The situation differs markedly form one international organization to another. The Secretary General of the United Nations and the head of the International Labour Organization enjoy that right, for instance, with various conditions. In the WTO, no such right is enshrined in its constitution, and when/if the head of the organization or its Secretariat advance their views, they take enormous risks in doing so. Countries prefer to tighten the leash on the powers they devolve out of sovereignty concerns, but in so doing, they imperil the functioning and even the survival of the very institutions that they worked so hard to create. In my view, his issue cries out for attention and reform. Ladies and gentlemen, to conclude, globalization today is posing a serious challenge for our democracies; and our governance systems must respond to it. If our citizens feel that the global problems are insoluble, if they feel they are out of reach, this will risk emasculating our democracies. The same will be true if our citizens see that global problems can be addressed but they have no influence on the result. Today, more than ever, our governance systems, at whatever level they may by, must provide citizens with avenues for shaping tomorrow's world, the one they want their children and grandchildren to inherit. So where is the world headed? Towards more globalization, not less. Technology, the engine of globalization, does not move backwards. We are headed towards deeper integration, wider cooperation, an even greater sharing of responsibilities and interests. Governing this globalized world can be messy and frustrating. But the fiction that there is an alternative is naïve and dangerous. Naïve because it ignores that we are becoming more — not less — dependent on one another. Dangerous because it risks plunging us back to our divided past — with all of its conflicts and tragedies. We must work towards a global governance architecture that allows different international organization to borrow from each other the governance systems that work. That teach each other what pitfalls to avoid. The WTO has a little to teach, but also much to borrow. We must also work towards a system of global governance that enshrines the concept of hard and enforceable law, that respects the principle of subsidiarity, that fosters greater coherence, that takes international issues as close as possible to "home" for each and every citizen amongst us. It must be based on values that can be shared across civilizations, cultures and religions. In sum, we need more solid governance systems, and less liquid and gaseous ones. With this, I thank you for your attention, and would like to wish you a fruitful academic year. Acting on the Lamy Challenge? This is a call to action, similar to appeals heard repeatedly in recent years, not least in a unique 2010 joint report by the United States National Intellignce Committee and the Security Studies Institute of the EU. Lamy is to be congratulated for adding his influential voice to this intensfiying demand for radically altered global governance. Some progress has been made. The Merkel initiative mentioned by Lamy sounds promising as an underpinning of a new global social contract. Yet the less than satisfying respone by international institutions to the unfolding economic crises in southern Europe and northern Africa these past two years suggest a strong disconnect between these communities suffering economic shock and the global and regional institutions. In 2011, a landmark team study by the Organisation for Economic Co-operation and Development on “Future Global Shocks” concluded that the international community should act urgently to better address the impacts (political, economic, security, social) of such shocks (http://www.oecd.org/governance/48256382.pdf). The study advocates the establishment of new mechanisms or “institutional strengthening” at all stages of the decision cycle for risk management. Its call for building resilience in global, regional and national systems cannot be left to the technocratic actors. Leaders in international civil society need to act on these calls. The EastWest Institute (www.ewi.info) is currently canvassing ideas on what can be done at various levels to follow through on these calls . What are the concrete and practicable measures that will actually connect the interests of communities worst affected by global economic shocks with the international economic actors whose decisions and choices, though a rational reaction to bad policy by third parties, so unequivocally destroy community livelihoods? Lamy has part of the answer. There has to be more democratic accountability for failed economic and fiscal policy by those who make the blunders. That will be hard enough. The bigger challenge will continue to be preserving some sense of social solidarity and social security as living standards fall.We need "new economic thinking".